Applegate-Fairbairn inspired stiletto neck knife. Features include a tempered 440C stainless steel blade with titanium coating for corrosion resistance, and a safety guard to keep your hand from moving while performing jabs. 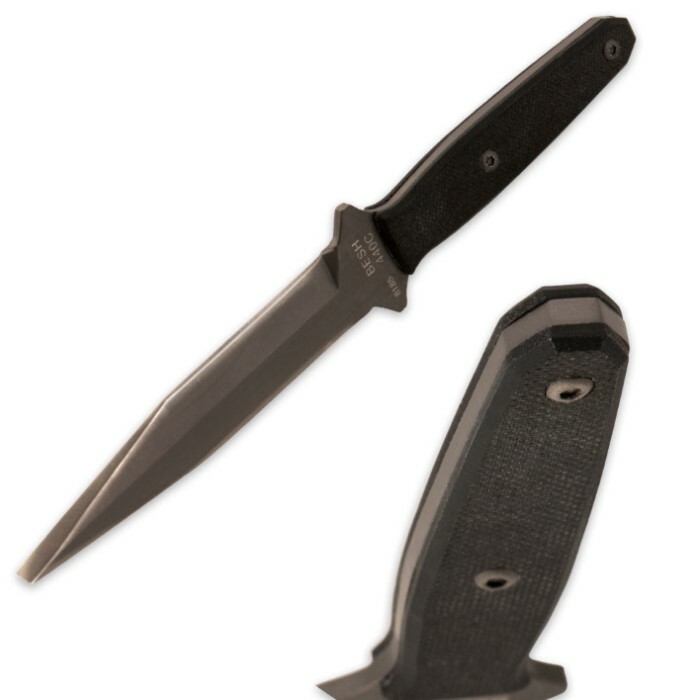 The handle is lined with tough G10 scales and a hard Kydex sheath with ball chain is included. At just 2.5 oz., this piece is light enough to hang under your shirt as a self defense neck knife, ready to perform at a moments notice. 4 1/4 in. blade, 7 1/4 in. overall. Comes in a nice padded box suitable for gifting. As I removed the knife from the box, I was surprised by the design, as I am not familiar with Besh designed knives. Unique and serviceable. Flat edges are very sharp. Not so much on the tapered portion of the blade. Kydex sheath holds the knife very securely, but I'm not a fan of the neck chain. Thinking about converting it to horizontal belt carry. Handle is secure with no looseness in the scales... 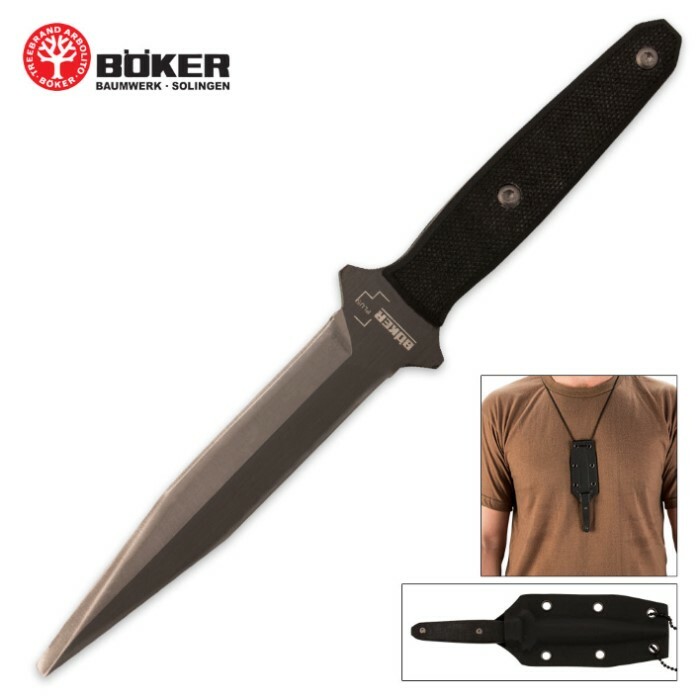 Always been a big fan of Boker knives and this one great.. I have been collecting for many years and this little knife is definitely a stand out in my collection. Love the uniqueness and durability of the Besh-Wedge design. Boker quality and German steel never disappoint. Razor sharp, well balanced, compact and yet not to small to be functional. Was expecting a chrome finish from the photos but mine came as a oil rubbed dark finish. No complaints though as I like the stealthier black tone anyway. My sheath was also different than the one pictured...no wing things, more of a traditional kydex sheath. Again I'm not complaining as I prefer the more streamlined design that came with mine. Absolutely love this blade and carry it everyday highly recommend it. Me and buds kayak East Texas and West Louisiana Rivers, Creeks, and Swamps. We paddle at night and get to see all the pretty eyes floating around. 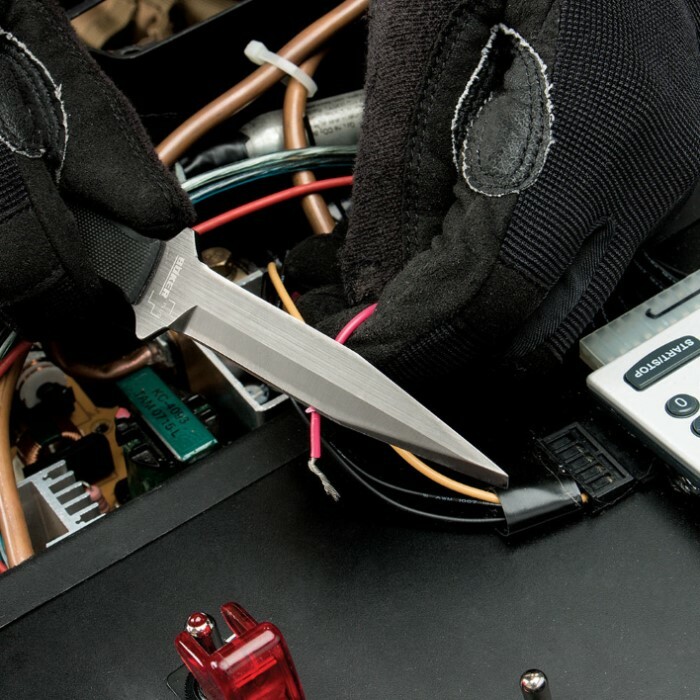 This knife is practical! Comfortable and fast!!! Good steel that holds an edge..It's a knife! It skins pretty decent, too. I sure hope that guy that can't find the point doesn't cut hisself giving it away. Me, I'll take it and pay for shipping! Comfortable carry design, secure quality kydex holster. Excellent design with double edge, rounded tip and textured handle assuring secure grip. Fast draw from on under and tucked in dress shirt with practice. Replaced designed break away quality chain with black para cord knotted for quick emergency release. This is every day carry in very humid environment. Highly recommend for those wanting discrete defense and executive letter opening. Extreme quality in a small knife. Love the Kydex sheath. Razor sharp out of the box. No flaws. Very nice compact knife, razor sharp. The price was the best I found on the web. I really like this knife. It is very flat with almost no "print" under my shirt. The Besh-Wedge is not supposed to have a point. The Besh grind makes a wedge shape. The tip is much stronger than if it was pointed - kind of like a tanto tip. Interesting knife. The tip is flat but definitely good for piercing, and very handy.